You are currently browsing the CycleStreets blog archives for September, 2012. We’ve issued version 2 of our iPhone app! Get it free from the iTunes App Store. It adds several great new features, including the ability to see a range of route choices and switch between them easily. Please do give a review of the app in the App Store. We reissued this release after a bug was found that prevented the app loading or planning routes – apologies to users who ran into this. Just get the new one and all should be fine. This app has only been possible thanks to the hard work of volunteer Neil Edwards, who has added all the new features and done lots of restructuring of the code to make future updates easier to add. If you’re an Objective-C programmer and would like to join our team, do get the code and have a look at the feature/bug ticket list. Thanks also to Ayesha who sorted out an updated high-resolution loading screen for the app. Having planned a route, you can immediately switch to a different route type. The route listing display has also been enhanced, with the calories required to cycle a route, and the equivalent CO2 saved compared to a car journey. The England Cycling Data project aims to incorporate open data on cycling infrastructure released by the UK’s Department for Transport into OpenStreetMap. We’ve started taking account of a greater range of information about cycle routes in OpenStreetMap (the project from which our routing is created). In particular, taking account of surface quality, barriers, traffic calming, and lighting in the routing, and have been continuing to develop this. Earlier this year the DfT made available cycling data for England collected from surveying they undertook over the last few years. This has been converted to an OpenStreetMap-compatible format so that volunteers in the OSM community in each area can merge it in. The OS Open Data -based geometry has been ‘snapped’ to OSM geometries with intelligent matching of paths, and the metadata has been converted to using the OSM tagging system. This became available in June. The conversion work has been undertaken by CycleCity Guides, who also did the original professional surveying for the DfT. The conversion work they have undertaken has been first-rate, and we’ve been impressed by the diligence taken, and accuracy of, the conversion process. We were particularly impressed by the skills of CCG’s GIS expert, Ralph Hughes. They seemed comfortable working with OpenStreetMap data and open data more generally as part of this process. We can certainly recommend CCG if you need professional surveying or data conversion work doing. The challenge now is to merge as much of this into OpenStreetMap as possible. Andy Allan, one of the creators of the widely-used Potlatch 2 editor for OpenStreetMap, has created a new merging tool for OpenStreetMap. This was beta-tested earlier this year, and recent discussions on the OSM talk-gb mailing list have helped us identify some further improvements that will help assist the merging process. Click ‘Map style’ > ‘Wireframe’ to make things much easier to work with. The background data is highlighted either orange (needs attention) or blue (already processed). Click a background feature to select it. 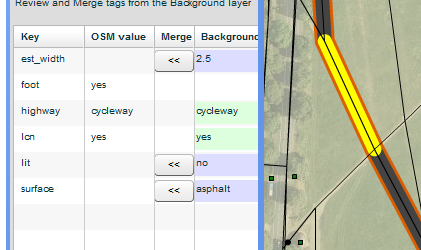 Ctrl+click (or cmd+click on a Mac keyboard) the relevant OSM feature to see a side-by-side comparison of the tags. Mark the background features as complete if there’s no more information to reconcile. It takes about a day and a half to do a city the size of Cambridge (which has a lot of cycle infrastructure). Naturally, it does require local recognition of the area, but is a satisfying process. We know that trying to get large areas of England in is a big task, and it will be interesting to see how the OSM community finds this in practice. So we’d welcome any feedback on your experiences with this data. We’ve discussed with Andy Allan the remaining fixes needed to the merging tool, and have reserved funding for this. Clearly, we want to ensure this large task is made as easy as possible. Shaun McDonald of ITO World has been working on some visualisations which we hope to report further on soon. We’ve secured and written some articles for various widely-circulated cycling campaign magazines/newsletters, which we hope will raise awareness of OSM and introduce people to this data, as projects they could get involved in.